Cold climate air source heat pumps are one of the three technologies offered through HeatSmart CCL. Learn more about how they work and get your questions answered. Don't see your question answered below? Reach out to us or our selected installer and we'll get back to you as soon as we can. Can air source heat pumps provide domestic hot water? I've heard that heat pumps can sometimes blow cold air? How much will an air source heat pump cost? Air source heat pumps (ASHP) are electric appliances that provide heating and cooling by moving heat into a home or building (for heating) or out of a building (for cooling). Heat pumps do not create heat like electric resistance heating or fossil fuel-fired heating systems; instead, they move heat from one place to another. ASHPs use the outdoor air as a source of heat, while ground source (or geothermal) heat pumps use the ground as a source of heat. They accomplish this by using a refrigerant that absorbs heat from colder air to move that heat into a space with warmer air—much the same way that a refrigerator or air conditioner works, except that it can move heat in both directions to provide both heating and cooling. Since it takes far less energy to move heat than it does to create heat, ASHPs are one of the most efficient home heating systems available. 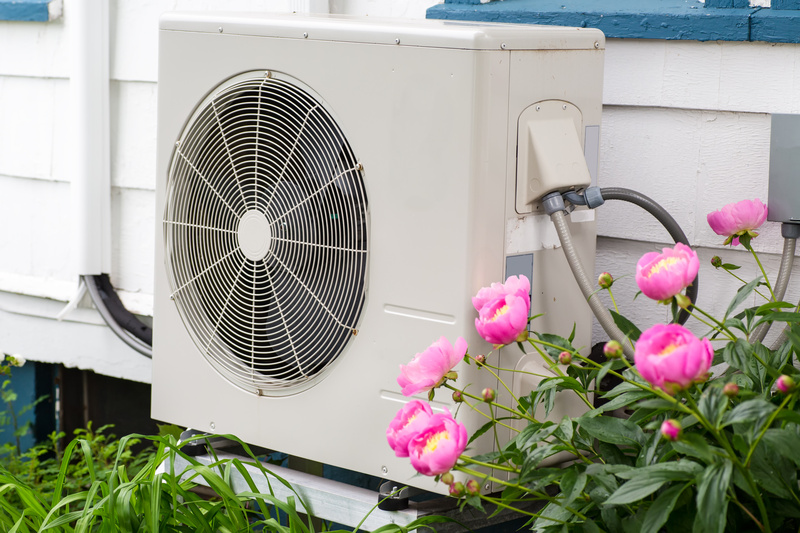 Ducted air source heat pumps have an outdoor unit that is connected to a building's ductwork, which is used to distribute heating or air conditioning throughout the home. Ducted (also known as central or unitary) use your home’s existing ductwork, though not all ductwork is sized adequately for heat pumps. 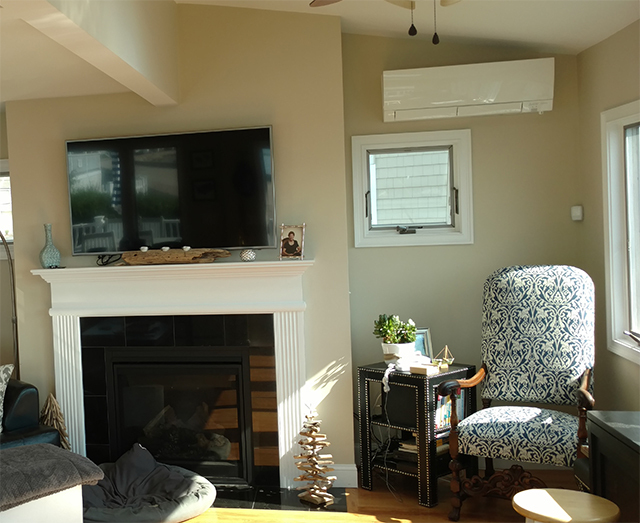 Our installer, New England Ductless, can tell you if your ductwork is sized adequately and what modifications may be necessary during a free site visit. Improved home comfort. Advanced air source heat pumps are "variable capacity," which means they can provide just the right amount of heating or cooling without temperature swings and constantly turning on and off. Also, they are much quieter than conventional air conditioners and furnaces. Energy savings. If you heat with oil, propane, or electric resistance (such as electric baseboards), you could save hundreds of dollars a year on your heating bill by installing an air source heat pump. No need to pay thousands of dollars to get a natural gas connection to your home: a cleaner alternative is already available. High-efficiency cooling, no ductwork required. Air source heat pumps also provide air conditioning or dehumidification and are more efficient than window units and most central air conditioning systems. 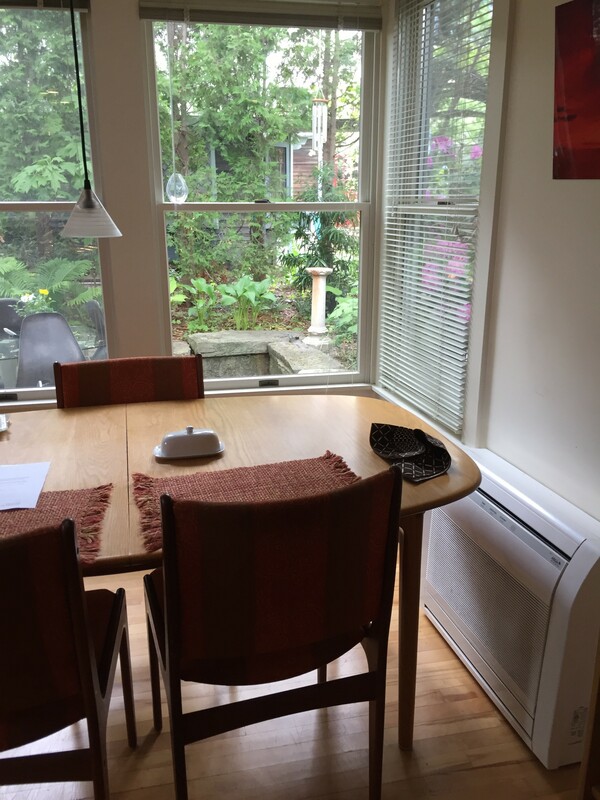 Ductless ASHPs can allow you to reclaim your windows and avoid having to install ductwork to stay comfortable in the summer. Improved health and air quality. In addition to providing cooling, heat pumps filter and dehumidify air, which can improve the air quality and comfort of your home. In particular, the filtration provided by advanced ASHP systems can significantly reduce allergens in your home for sensitive individuals. Flexible options. Heat pumps are a flexible technology that can be installed in homes of all shapes and sizes with different needs—whether you need a whole-home system replacement, have (or don’t have) ductwork, want to add zoning to your home, want to increase the efficiency of heating part of your home, or want to add extra heating/cooling to that part of your home that’s never as comfortable as it should be. Traditional ASHPs are known for their poor cold-climate performance: these systems have been primarily used in the South for decades and are optimized for a warmer climate where air conditioning needs are higher. The ASHPs installed through HeatSmart CCL are cutting-edge cold-climate models that are optimized for New England weather. These cold climate ASHPs are certified based on their performance at 5°F and can continue providing heat even when winter air is well below zero: today’s cold climate air source heat pumps can extract heat from the air all the way down to -13°F. Performance in extreme cold. Since ASHPs rely on extracting heat from the outdoor air, the heating output and efficiency of ASHPs declines as outdoor air temperature declines. While the cold climate ASHPs installed through HeatSmart CCL are rated based on their performance at 5°F, for many homes, our installer will recommend keeping a backup system (your existing system or added electric baseboards) for the coldest days of the year. During some of those particularly cold days, it may make more economic sense to shut off your ASHP and use your backup fossil fuel system to provide heating. It's unlikely, however, that your ASHP will stop providing heat entirely—even in the prolonged cold snap this past January. Aesthetic considerations. ASHPs require outdoor (e.g. outdoor unit and piping) and ductless ASHPs require indoor equipment (e.g. wall-mounted units) that may be aesthetically displeasing to some homeowners. Our installer can discuss a variety of options available to you to minimize aesthetic impacts from an ASHP installation. Manual coordination of thermostats. Thermostats for ductless ASHPs typically operate independently of your existing thermostat. This means that you will need to set your existing thermostat lower than your ASHP thermostat to ensure that your ASHP does the bulk of the heating. Some Mitsubishi models offer software upgrades now that can allow your heat pump system to control your backup system. Higher installed costs. ASHPs cost more upfront than fossil fuel or central AC systems. However, their higher efficiency can pay back the difference over the course of several years. Lower efficiency than GSHPs. Since the outdoor air is more variable in temperature than the ground, ASHPs are typically less efficient than geothermal heat pumps. However, ASHPs are usually cheaper and quicker to install. Do you heat with oil, propane or electric resistance (such as baseboard electric)? Do you want greater home comfort (more uniform air temperature and less noise)? Is your existing heating or air conditioning system 15+ years old? Air source heat pumps are considered to be “clean” heating and cooling systems because they do not create heat, but rather they move renewable heat from the ambient air from one place to another. This process is powered by electricity, which can also be sourced from renewable sources like solar, wind, or hydro. Even though our grid is only about 12% renewable today (and getting greener year by year), an ASHP system powered by grid electricity will still reduce your greenhouse gas emissions from heating by 20-60%! ASHPs are typically rated for heating efficiency based on their Heating Seasonal Performance Factor (HSPF) or seasonal Coefficient of Performance (COP), both of which describe the system’s efficiency over the course of the heating season. The seasonal efficiency of ASHPs can range from 220% to 300%+ (i.e. COP of 2.2 to 3.0) depending on the system type, application, and how cold it is outside. That means that for every one unit of electricity used, 2.2 to 3 units of heat are transferred into the home. By comparison, electric resistance heating has a COP of 1, and fossil fuel boilers and furnaces can be 75-95% efficient. ASHPs also provide high-efficiency cooling—better than window AC units and comparable to the highest-efficiency central air conditioners. Annual system maintenance, which consists of cleaning air filters and an annual maintenance checkup for the outside unit, costs about the same as annual servicing charges for a boiler or furnace. You can also clean the filters yourself, which can help to keep your system running well for many years (ask our installer for tips on how best to do this!). Otherwise, the only other maintenance requirement would be to keep your outdoor unit clear of snow during the winter. How noisy are air source heat pumps? A ductless ASHP indoor unit is quieter when running than a refrigerator and much quieter than a typical window AC unit. A ducted ASHP is quieter than a typical furnace or central air conditioner. Can air source heat pumps provide domestic hot water? Most don't. There are water heaters that use heat pump technology (heat pump water heaters or HPWHs), though they are considered different technologies than ASHPs and are not included in the special HeatSmart CCL offer. Our installer does offer HPWHs, however, and can provide you with more information when they come for a site visit. A heat pump installation is typically a straightforward process with minimal disruption to your home. A simple, single-zone ductless ASHP system can be completed in less than a day and only requires a single 2-3 inch hole to be cut (and later, sealed) in your wall. “Set it and forget it.” While many of us are used to turning off the lights and turning down the heat when you leave the home or go to sleep, heat pumps are most efficient when running continuously at partial output without sudden increases in heating demand from cranking the thermostat up. Think about how your car’s mileage improves when you drive at a constant speed instead of constantly stopping and starting. Consider only setting back your heat pump system thermostat when you’re gone for several days. Know when to use your backup system. Depending on the weather and the cost of your backup heating fuel, it may be more efficient to use your backup system during the coldest parts of the year when heat pumps are at their least efficient. If you expect the temperature to be in the single digits or lower for the day, consider turning your heat pump system off and using your backup boiler or furnace. Keep your system well-maintained. A well-maintained system will keep performing at high efficiency. Remember to clean your indoor dust filters; keep the outdoor unit free of snow, ice, and other obstructions; and consider getting regular annual servicing. Improve the efficiency of your home. A heat pump in a well-insulated home will perform better than a poorly-insulated home. Consider getting approved, incentivized insulation, air sealing, and weatherization upgrades through Mass Save or the Concord MLP prior to installing your heat pump. Not only will your home be even more comfortable and your system perform better, but you may need a smaller (and cheaper) system to meet your home’s needs. Heat pumps do not provide the same blast of very hot air that furnaces provide just due to the nature of how they generate heat: heat pumps are transferring heat from outdoors as opposed to heating air by burning fossil fuels. When it’s particularly cold outside, this air can feel cool to the touch but may still be 75-80°F or more and is working normally. Heat pumps occasionally run in “defrost mode” to keep the outdoor unit clear of any frost buildup. For a few minutes your heat pump will stop producing heat, which can sometimes include a sudden, brief blast of cooler air. This is normal during winter operation and will not compromise the performance of your system. If your heat pump is providing inadequate heat, you may consider using your backup system during temperature extremes. If your heat pump continues to blow cold air, you may have a maintenance issue with your system and should contact an installer. How much will an air source heat pump cost? 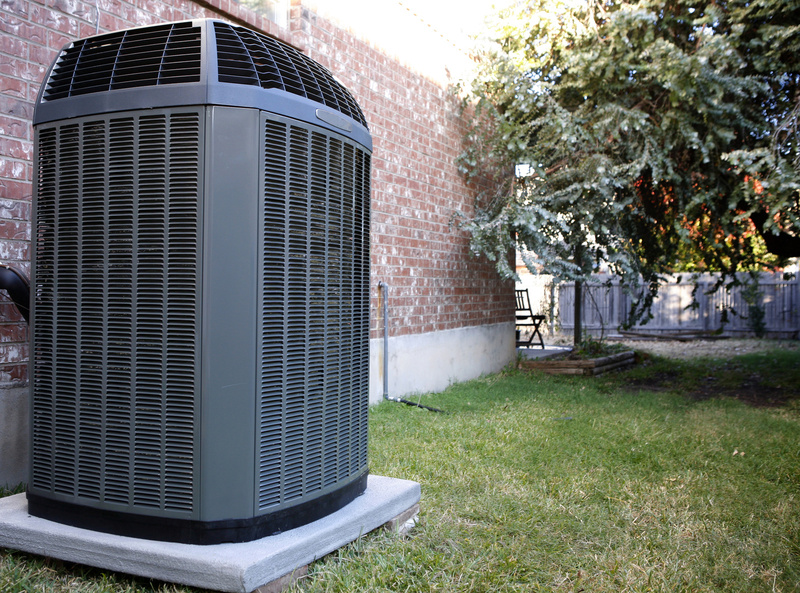 Air source heat pump systems typically start at around $4,500 before incentives for a single-zone unit, increasing with additional zones and if you are interested in using a heat pump as your primary source of heat. Consult the New England Ductless HeatSmart CCL Pricing sheet here. If you have questions about pricing, consider discussing your various needs and options with New England Ductless during a free site visit. A more detailed version is available here. Ready to get a free site visit from New England Ductless?